What would you do if you were heading on a skiing trip to the British Columbia backcountry with your buddy the Black Diamond rep? You’d hop right into a nearby phone booth and become Black Diamond Boy of course! I was so well outfitted from head-to-toe in touring gear that I only brought a carry-on onto the plane, as my BD package took care of everything else. Perhaps the best thing about BD/Fritischi’s entry into the tech binding game is that unlike Dynafits, the Vipec heel slides forward and aft to engage the boot. This means that when touring back across the meadow to the lodge, while my cohorts had to release to get into tour mode, I simply pressed the heel tab and voila! the heel pins slid backward, allowing me to freeheel across the flats. For climbing, the heel lifts flipped into place easily with my pole basket (note: it’s easier to flip into high climb mode than medium). For skiing, the binding never released at all, increasing my confidence on the high alpine steeps each day, thanks it part to its Safety Pin System whose gliding heel creates active length compensation when the ski is flexed. The designers say that by maintaining a consistent contact pressure, the bindings deliver a pre-defined release when the boot/binding interface exceeds its dynamic range. Billed as the world’s first binding to combine a lightweight pin system with the pre-defined safety release of an alpine binding, the Vipec 12’s toe pin unit slides laterally, with 13mm of range before release. The first thing I noticed about these skins is how well they glide. Where other skins often feel like glue on the flats, these babies schussed multiple feet per glide, which adds up quickly on a 4,000-foot day. Made from 65 percent mohair and 35 percent nylon, they come with an adjustable tip loop attachment to fit a range of widths. When put to the test on the slopes they were bomber, with no errant kick-offs from the opposite ski. On the tail, BD’s patented STS tail system provides 10 cm of adjustability. Mine cinched snug in the rear with nary a sign of loosening. As for adhesion, they stayed on great, to the point of forcing me to take off my skis altogether to remove them. I just couldn’t manage the reach-down-and-rip move I’ve perfected on my own lamer-glue skins. Non-glue strips down the center did make removability easier however, especially when unfolding to use again. While supple for folding, and coming in packable design that are 1.4 oz. lighter than the Ascension skins, they did end up in an origami cluster when taking them off in 40 mph gales. But that’s likely happen to anyone who isn’t named Greg Hill, so be prepared. It’s naïve to head out on a five-day backcountry trip in boots you’ve never seen before, let alone used. But putting faith in the blister gods I did just that, without suffering one hot spot the entire time. These tech-compatible boots fit like a proverbial glove right out of the box, and were comfortable without being confining. The next thing that struck me about the Quadrant boot was just how lightweight they actually are. This first came to my attention when making gear laps from the heli to the lodge. When it came time to tour, the boot’s Triax Pivot frame offered 40 degrees of motion, which was appreciated on slog to the backside of Mission Ridge. While I found it odd that its lowest buckles fastened opposite from all the others, the locking QuickWire held fast. Delivering on the down was its four-buckle plus Powerstrap design, as well as soft snow-friendly 120 flex. In short, it lived up to its billing of combining freeride performance in a touring-focused design. Out of the skis, its rockered, rubber outsole gripped when booting, whether to avoid that icy cluster kickturn (thanks Paul) or tromping out to the LZ. In this whacko ski season up north, we had every condition imaginable: frozen crust in the morning, heavy gunk down low, corn in the afternoon, and creamy pow in the high alpine. The new-for-2016 BD Link 105 handled it all like any red-blooded Canuck does a hockey stick, which is to say very well. While I didn’t get to test the 105mm in waist-deep BC powder, the rockered tip and tail with traditional camber underfoot and 132mm shovel (172cm) kept these skis floaty and snappy. They did sink into the Pineapple Express glop once when we toured below 6,200 feet, but even Chris Davenport would have suffered the same fate in those conditions. Later, when a cold snap firmed things up, the sidewall dampening system and 3D sandwich/paulownia wood core held an edge incredibly well. This was to be expected considering they’re designed for a 70/30 split between soft and hard snow however. Okay, so trying new pants is a little risky since you don’t know exactly how they’ll fit in the crotch. But BD’s hybrid Recon pants combine a DWR-finished Windstopper shell with Schoeler softshell panels stretch-woven with NanoSphere Tech to create a comfortable fit. Key features include an integrated Pieps Pocket lined with impact foam, complete with an internal harness for quick-access beacon storage. They also come equipped with RECCO technology, removable waist belt, mambo, well-thought-out thigh pockets, offset side venting, and boot-access zippers for the quick buckle fixes. Where these pants shined the most was when the wet snow turned to rain (yes, it rained), which is when the beefy combo material beaded up the moisture and shed it right back into the BC snowpack, keeping me warm and dry the entire time. I climb hot, so rarely do I wear a shell on the up. Thankfully, the Sharp End is one of BD’s lightest GORE-TEX® Pro wares to date, clocking in at just 14 ounces, which is coincidentally just one ounce more than a Kokanee beer. Trimmed-down features and lighter face fabric emphasize packability, which came in handy since I found the Jet Force pack spatially challenged. But the jacket’s lightness doesn’t dampen its performance when battling the elements. We faced snow, sleet, and rain – as well as 50-mph wind gusts – and it easily handled everything that Mother Nature threw our way. While I never (thankfully) had to use the Evac 7 shovel for an avi burial, this baby worked great for everything from digging pits to sculpting the snow-sofa outside the lodge. Its D-handle features two configurations, easily switching from conventional blade to a hoe shape as needed. The hoe works exceptionally well for rapid snow removal, which makes it handy in an emergency situation. When digging our pit, and sofa back, the Evac’s anodized, flat-bottom blade created a clean face all around. When stashing it inside the Jet Force pack, the shovel broke down to a storage-friendly 26” while extending out to a back-saving 37” when it was time to go to work. The only knock was packing the curved handle, which took up a little extra space than I would have liked. Named for its 320cm length when deployed, this all-aluminum probe is built to plunge, plain and simple. When I pulled it out of its perch in my pack, its dual quickdraw speed ferrules made it snap into place faster than our mid-sauna snow dips. Designed for snow study, ski guides, patrollers and skiing steep and deep terrain, we never had to probe with it at all during our time on the slopes. But it was nice to know my teammates were carrying them in case of an emergency. Made from waterproof and breathable GORE-TEX with a removable PrimaLoft One/boiled wool liner, these are BD’s warmest offering, as evidenced by my need to take them off while touring. A four-way-stretch woven nylon shell and goat leather palm keeps them supple enough to remove skins and fuss with hoods and buckles, while the GORE-TEX kept them waterproof in the freakish rain, or when one of my companions got over-zealous while opening my water bottle. Okay, so how exactly do you review a beanie? You put it on, it keeps your head warm, and that’s that. That was the case with this one as well, though its ring of Black Diamond insignia managed to cap the BD Boy outfit perfectly. While I regularly use BD’s trusty Traverse poles at home, here I was privy to the company’s Razor Carbons, which are uber-light and designed for touring. I tested the smaller version, which extends from 39”-49” and collapses down to just 36”. I would’ve liked a setting that was just a hair taller for scooting across the flats however, as over the years I’ve finally realize the advantage of a taller pole setting at certain times. If you’re skiing big terrain, which is what BC’s all about, airbags are your best friend, giving you the chance to float to the surface in an emergency situation. BD’s entry into the category is the Halo 28 Jet Force, the first airbag to run on a battery-powered jet-fan instead of compressed nitrogen (ABS) or compressed air (BCA). 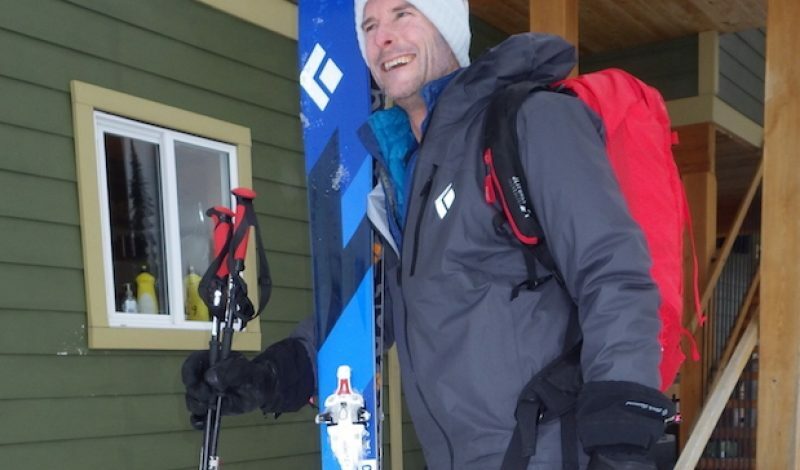 A collaboration between Black Diamond and Pieps, the airbag runs on a rechargeable lithium-ion battery that supports four deployments per charge. 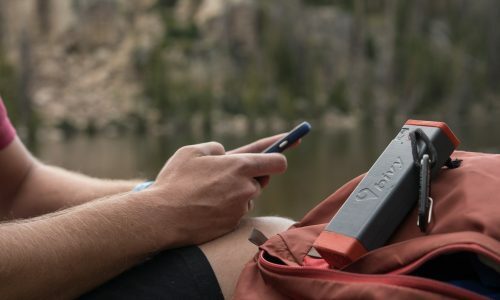 It inflates a 200L puncture-resistant Cordura airbag in four seconds, and then pulses back on to keep the air inside (a nice touch if it gets torn) before automatically deflating after three minutes to create a potential air pocket. After deploying it three times in après mode, in which it performed admirably each time. I found the bag is easy to re-stuff too, which has the increased benefit of allowing you to practice its use much more efficiently. A word to the wise however: it’s a tad noisy, so be prepared. On the pack side, a zippered backpanel provides easy accesses to the inside, where the shovel and probe fit in a dedicated avi-tools pocket. 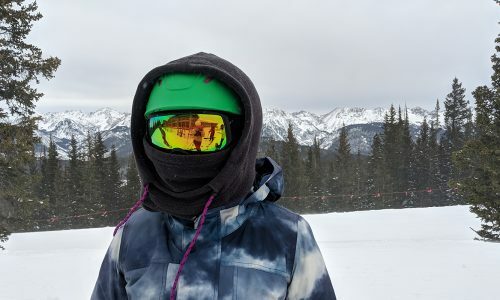 A HiLo helmet holder deploys out of the bottom of the pack, which also comes with an ice-axe attachment, tuck-away diagonal ski carry loops, SwingArm™ shoulder straps, and hipbelt stash pockets, one of which holds a crotch harness.